This volume is the latest in SUNY’s Contemporary Continental Philosophy series to address the legacy of Martin Heidegger’s notorious readings of Friedrich Hölderlin’s poems. These readings persist as founding texts of twentieth-century (and more recent) attempts to map the relationship between philosophy and poetry and its implications for ethics and politics, especially in the wake of what we’ve come to understand by the signifier “Auschwitz”. Heidegger’s later thinking operates as the guiding thread of this study. The texts from which Bambach takes his fundamental questions – most of which are collected in English in Poetry, Language, Thought (1971), Hölderlin’s Hymn ‘The Ister’ (1996) and Elucidations of Hölderlin’s Poetry (2000) – are made to resonate alongside beautifully-nuanced, close, textual readings of, in Bambach’s words, “two philosophical poets who stand at the bookends of modernity” – Friedrich Hölderlin (born 1770) and the late-Modernist, German-Jewish poet Paul Celan (died 1970). At the centre of this hermeneutic engagement with Hölderlin and Celan stands the conversation with Martin Heidegger about the meaning of poetic dwelling as a measure for a nonsubjective form of ethos. Ethics is possible – in the sense of poetic dwelling – only insofar as we genuinely dwell, an insight that Heidegger draws from his reading of Hölderlin. Our proper home is language, and the poet speaks both to and from our condition of homelessness. The poet acknowledges that we are strangely not at home in language and, in his poeticizing, addresses this strange destiny as what is proper to us. At the same time, the poet acknowledges that we need to reclaim our lost home in being by carefully attending to the resonances of the poetic word as a way to find our way back home […] but it also helps in attuning us to the ethical struggle for sense amid the senselessness of the modern condition. Paul Celan’s poems often begin from this condition of senselessness and homelessness: “White stacked into distance. / Above it, endless, / the sleigh-track of the lost”, he writes in ‘Homecoming’ . 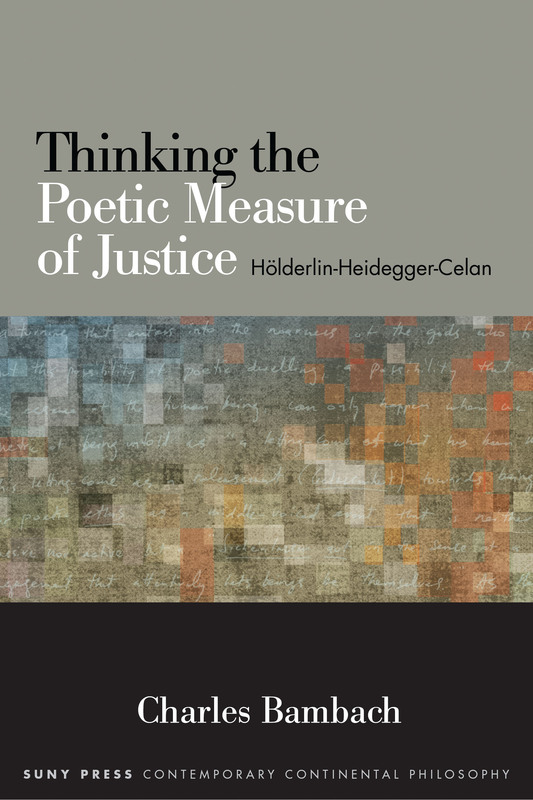 Celan’s central role in this study is especially compelling in light of his intense philosophical engagement with Heidegger’s works, which we find evidence for both in what became a protracted correspondence, culminating in the trip to Heidegger’s hut at Todtnauberg in 1968, as well as in Celan’s poetry itself . Harnessed frequently by those who would claim a certain fidelity to Heidegger’s founding insights, Celan’s poetry is read here too as both “reinscribing” and “disrupting” Heideggerian fundaments – most pertinently, the movement of “homecoming” Heidegger derives from Hölderlin – by offering an account of poetic measure, of the possibility of “justice”, which takes into account its aporias and ellipses. This manoeuvre is reflective more broadly of Bambach’s alignment with an ostensibly French theoretical constellation comprising Maurice Blanchot, Jacques Derrida, Phillipe Lacoue-Labarthe and Jean-Luc Nancy, among others, for whom Heidegger remains central, despite the intensity of critique directed towards his various complicities in Nazism. Bambach’s writing stands alongside similar studies then, such as Lacoue-Labarthe’s Heidegger and the Politics of Poetry, which both reappraise and criticise Heidegger’s thought from within the bounds of Heideggerian thinking; which is to say, in other words, that for Bambach philosophical investigation remains inextricably bound to the power of language. He remains within a Heideggerian framework, broadly speaking, because he tasks poetry alone with the capacity to present a measure, to most attentively interrogate being’s relations to ethics and justice. Mobilising Derrida later on in the study, Bambach reads Celan’s poems as orienting themselves, with Heidegger, towards the future, “a justice to come”, or “the promise of a historical dwelling place” while, against him, “holding out the memory of exile, banishment, and deportation.” For Bambach, then, “justice”, is only able to emerge from this enduringly intimate trio – Hölderlin, Heidegger, Celan – with the interrogation of fundamental tensions at the heart of what he defines as “German philosophical thought in the twentieth century”: same/other, native/foreign, proper/strange. Broadly construed, these are dynamisms concerning the problem of identity – of the subject, the community, and the homeland – and they comprise the site upon which Bambach’s subtle and wide-ranging investigation takes place. Despite the maintenance in this study of what Alain Badiou refers to as one of Heidegger’s “stroke[s] of genius”, then, the recognition that philosophy reached a point at which it could “hand [itself] over to poetry” (see Badiou’s Manifesto for Philosophy, especially ‘The Age of Poets’ ), there is nonetheless the attempt, reminiscent of Lacoue-Labarthe and of other thinkers less sympathetic to Heidegger’s thought like Adorno, to offer Hölderlin’s poems shelter from some of the more troubling aspects of Heidegger’s engagement with them. This is especially true of Bambach’s analysis of the Heideggerian movement of “homecoming” which works on the Homeric schema of a movement towards the other for the sake of the same or “the proper”. More concretely, the elevation of a kind of originary cultural identity of “the German people” comes to pervade Heidegger’s writings on Hölderlin, and this is mirrored in the ideological and mythical supports of National Socialism’s exclusion and subsequent extermination of the other. Reading Hölderlin’s ‘The Ister’ Heidegger remarks that the poet may only “learn the free use of what is proper to him” by fulfilling one of the conditions of “becoming at home in what is proper […]”: “the voyage into the foreign land” . The following year in 1943, Heidegger commemorates the hundredth anniversary of Hölderlin’s death with an address subsequently titled “Homecoming / To Kindred Ones”. There, a sinister reminder of the sacrifice of those “sons of the homeland […] far distant from its soil” is followed by the explicit imbrication of poetic task with the violent assertion of national identity: “are not these sons of the homeland the poet’s closest kin?” The political stakes of homecoming then, a movement which depends on pre-verified limits and boundaries, on blood and soil, become clear: “homecoming”, Heidegger surmises, “is the future of the historical being of the German people.” The poetic task of homecoming finds its corollary then in the political attempt to inaugurate a new people through the violent dissolution of the other. To be German then, for Hölderlin, means to journey forth from the provinces and to leave behind what is familiar; it means to enter into the realm of what is foreign, strange, and other, so that what is one’s own can be cultivated in and through an encounter with alterity. Bambach claims that Heidegger’s reading of Hölderlin serves to obscure this fundamental aspect of exchange with the other by emphasising what he calls “the narrow myth of autochthony”, and later describes as “the myth of a pure Greek arche untouched by foreign influence.” The becoming of a people, for Hölderlin, is a reciprocal process demanding mutual exchange between native and foreign, and his account of the becoming of Ancient Greece, in Bambach’s reading, is no different. Far from being a pure arche then, Greece, for Hölderlin, depended on a “positive appropriation of the foreign”. Hölderlin, in his rejection of the hegemony of self-appropriation, holds much in common with what Bambach calls “the Jewish critique of ontology”, evinced by the likes Rosenweig, Lévinas, Derrida, and, crucially, Celan. For these thinkers, the mutual exchange between self and other at the heart of ancient Greece allows the “metaphysics of totality-identity that dominates the work of Western philosophy”, or the privileging of identity over difference, to be critiqued, as a way of overcoming the politicised motifs of authenticity and identity at work in Heidegger’s absolutization of the poem. A good deal of what follows can be read as a displaced conversation between Heidegger and Celan on the meaning of poetic dwelling as the measure of our human abode. If as Heidegger claims, “ethics ponders the abode of the human being”, then Celan’s poetry can be termed “ethical” for it thinks the lack of this abode for the Ostjude, for the exiled refugees of Central European power politics, for the unburied victims of the camps. […] the ellipsis also marks the trope of Abrahamic exile without the hope of an Odyssean return, the impossibility of Celan’s return home to the Bukovina. It is in this sense perhaps that we can read Celan’s relation to Heidegger as one marked by ellipses – especially Heidegger’s inability to think the ellipsis of the Jew in his Graeco-Germanic history of being. The task for the poet is to ensure such ellipses are sustained as dynamic sites of contradiction able to withstand the pressures exerted both by the drive to reconcilement and the appropriative “othering” central to any “return home” of “the same”. The poem opens, paradoxically enough, on a note of closure [‘Eyes talked into/blindness.’ in Michael Hamburger’s English translation]: eyes that normally see are ‘talked-into’ closing, persuaded through ‘blindness’. The German text begins ‘Zur Blindheit über-/redete Augen’ this initial use of the preposition ‘zu’ (to, toward) – ‘eyes talked-toward blindness’ literally – can be seen in tension with the very last words of the poem – ‘immer, immer-,/zuzu,’ which Felstiner loosely translates as ‘ever-ever-/moremore’. In this latter form, the word ‘zu’ functions as an adverb that means ‘closed’ or ‘shut’. In other words, both the first and last words of the poem […] turn on the Janus-like image of a door opening/closing. What we find here is a complex language of inversion and involution that remains hypersensitive to the possibilities of opening and closing – of eyes, of memory, of words, and of the eschatological language of a coming time. would mean to ceaselessly measure the incommensurability of a justice written with ellipses, a justice beyond our ken, a justice that would abandon the very nature of justice to take on a measure of hope – perhaps even a poetic measure. This is usefully explored elsewhere by James K. Lyon in his study Paul Celan and Martin Heidegger: An Unresolved Conversation, 1951-1970 (Baltimore, The John Hopkins University Press, 2006). Alain Badiou, Manifesto for Philosophy, trans. Norman Madarasz (Albany: SUNY, 1999). In Elucidations of Hölderlin’s Poetry, trans. Keith Hoeller (New York: Prometheus Books, 2000).